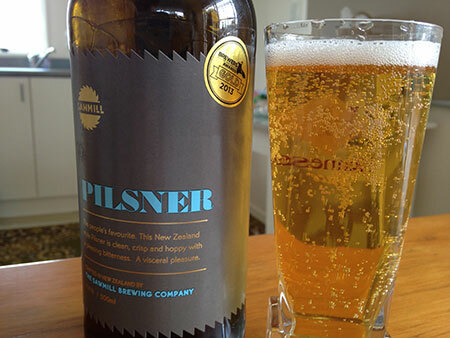 Bottle: Blue beer name, gold logo and writing, charcoal background with razor trim… the Sawmill Brewing Company keeps its craft beer labels simple, and the label on its 500ml bottle of pilsner is no different. Arguably, the most prominent feature on the label is the gold badge that proudly boasts of a gold medal won at the 2013 New Zealand Brewers Guild of New Zealand Awards. You really shouldn’t judge a beer by its label, but this one doesn’t scream out as a modern twist on the humble pilsner. Indeed, the minimalist styling of Sawmill’s pilsner bottle speaks of a beer that is “straight up” (check out the blurb on the bottle, below) and honest – a beer that doesn’t need flashy gimmicks to flatter discerning beer drinkers. Blurb on the bottle: The people’s favourite. This New Zealand style Pilsner is clean, crisp and hoppy with a pleasing bitterness. A visceral pleasure. Crafted in New Zealand by The Sawmill Brewing Company. At the Sawmill Brewery we make beer we want to drink – beer that is clean and flavoursome and straight up. We raise our glasses to the independent thinkers, rascals and raconteurs around us because that’s how it goes up here in Leigh, a place that has always drawn the resourceful and creative. And that’s why we love it. Tastes like: A summer’s day at the beach – Omaha Beach in the northern Auckland region to be exact. That’s where I took the bottle of Sawmill Pilsner that I purchased at the Matakana Village Farmers’ Market on a Saturday morning. A classic European-style pilsner, this beer is light golden with a prominent white head. It’s moderately malty, with a light floral flavour coming through. Is it the best beer ever? Well, no. Normally the beer in your hand is the best beer ever, but I also purchased a bottle of Sawmill Pale Ale at the Matakana market, and I prefer the much more complex flavours of that beer to the golden bitterness of this pilsner. That doesn’t mean it’s bad. Oh no, Sawmill Pilsner is very good. It stays true to the European style of pilsner, without really distinguishing itself (just like the label on the bottle). Potentially more memorable will be where you choose to enjoy this beer (I recommend the beach). What else should I drink? Sawmill’s Pale Ale for one. If you’re looking for a top European-style pilsner, however, then you can’t really go wrong with the original pilsner: Pilsner Urquell.